Poor and innocent, Aubriana Welbrey is concealing a terrible truth–her smuggling brother murdered the local revenue officer and she will do anything to protect him…even spy on the dark and dangerous Lord Ravenspur–a traitor to England, according to Sheriff Hodgeson who hired her. But to garner all of Ravenspur’s secrets, she must first become his mistress. 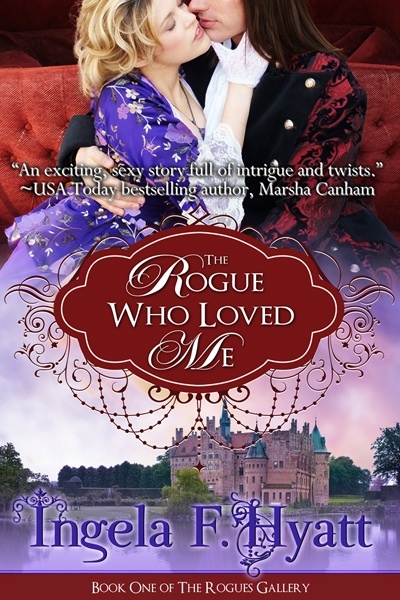 Alexande Telford, the Marquis of Ravenspur, is no insouciant Lothario as the ton believes–he’s a spy for the Crown, on a mission to capture the murderer of the revenue officer and stop a traitor from betraying England to France. Then there is his lovely new mistress, which Alex suspects may be somehow involved. Can he seduce her secrets without surrendering his own? As I started reading The Rogue Who Loved Me I noticed that Ms Hyatt started with an excerpt from a poem. I have found that while some authors dive right into the story others use different techniques to almost cue the reader’s mind before things really get going. I have seen prologues, quotes from (in) famous people, quotes form literary works and excerpts from poems. The quote, from one of Rudyard Kipling’s poems, that Ms Hyatt used not only made me expect intrigue but also a very vivid world as all of Kipling’s works included. I thought this was significant to mention because I noticed an immediate change in my perspective, mental outlook, and expectations for the novel I was about to start. I will admit as I read that I was slightly concerned about my expectations rising too much because everything seemed pretty straightforward at the beginning and I was sure I knew who the traitor was and who had committed the murder. I also didn’t like the hero initially because he certainly fit the description of a rake. Not just by his actions, what people said about his reputation but his very thoughts. Then I realized that unlike most rakes in historical romances I actually got proof that he was a rake besides having that title. Ms Hyatt used an alternating first person POV that gave me insight into Alexande’s character and I could actually see how his thought patterns changed from the pretty despicable rake to someone who I thought could actually be in a faithful relationship. I was cheering him on by the end of The Rogue Who Loved Me. Aubriana was also a much more complex character then she seemed at the beginning. She certainly did not fall into Alexande’s bed or arms easily. It was fascinating seeing her mental conflict as she struggled with her attraction for Alexande, her fear for her brother, and her reluctance to spy. She was certainly determined to succeed at whatever she attempted and that became readily apparent as she settled into her position with Alexande. I can’t say a lot about the murder, the traitor and the required misunderstanding without spoiling the book but I will say that I was very nicely surprised by the conclusion of those three elements. As a side note I would love to read the butler, Mr. Wiggins’s story *grin*.